I am very cautious about the herbal supplements that I take and one of the brands that I have been pleased with using in the past is Sainthood Herbs. I recently learned that this company has added nine new products in the HERBTHEORY collection with herbal supplements for both men and women. The latest products include Prostate Health, Male Fertility, 2-Day Detox, Lead Detox, Eye Care, Kidney Care, Female Fertility, Post Natal Slim and Hair, Skin & Nails. What attracted me to HERBTHEORY supplements is that the company uses wild-crafted herbs that are naturally derived, organic (as available) and non-GMO. I also appreciate that it is important to the company to choose safe ingredients that are proven effective through clinical studies. These are all factors that I consider before taking any herbal supplement. I am currently using two products from HERBTHEORY i.e. Blood Glucose and the Stress & Sleep Formula. 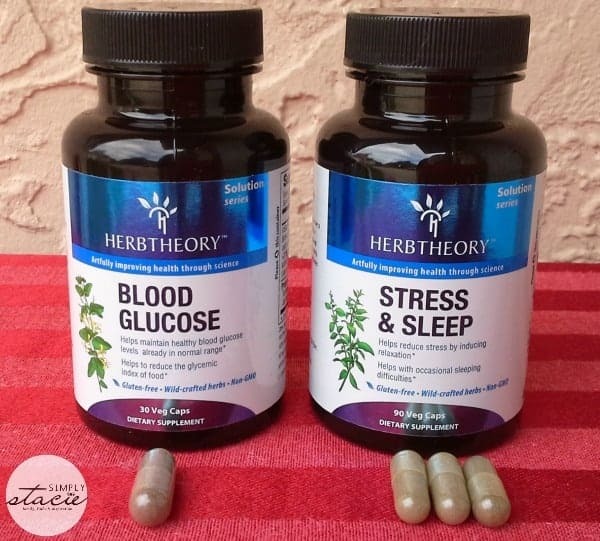 The HERBTHEORY Blood Glucose formula ($31.95) was created to possibly “help maintain healthy blood glucose levels already in normal range and help to reduce the glycemic index of food.” It is made with a Brown Seaweed Blend, Iodine, Turmeric, Astragalus Root and Japanese Honeysuckle. Per the instructions, I take one capsule 30 minutes prior to my largest meal of the day. This is a vegan and gluten free product so it can be used by those on specialty diets too. I eat a healthy diet with low glycemic foods so I was interested to see how this product would work for me. I have struggled in the past to lose weight especially when eating healthier foods that were higher on the glycemic index. Since using this product along with my current healthy routine and regular exercise, I have been steadily losing weight. While this product does not making any claims about it helping with weight loss, that is my purpose for using it and I will continue to do so as I am seeing results personally. I also like the HERBTHEORY Stress & Sleep formula ($28.95) may help “reduce stress by inducing relaxation” and possibly help with “occasional sleeping difficulties”. I am familiar with most of the ingredients in this product such as Lemon Balm Extract, Chinese Mint, Silk Tree and Jujube (seed). I take this product as needed in the evening when I am ready to relax. What I like is that it is not like a powerful sleeping pill with all of those awful side effects. Instead, I find that it has a very subtle effect that I like personally which allows me to enjoy the peace and calm after my three kids head to bed for the night. I have a good night of sleep when I take this supplement without any side effects noticed at all. You are invited to visit HERBTHEORY to find the perfect herbal supplement for you and your family and you can shop in the online store too. I would love to try blood glucose supplement. I would try the glucose one. I have a weird glucose issue where it gets a little low even when I eat foods that are supposed to be perfect for maintaining levels. I think this supplement might help me! Definately need the stress and sleep caps! I have diabetes2 so would choose the Blood Glucose formula in hopes it will help. The stress and sleep one would be great for me. I have MS and in a raging relapse presently. Stressors contribute the a tilt to my immune system attacking me the internship. Sad but true. Sleep is very elusive. Pain and tinnitus keep me awake. Thank you for this opportunity. I could really use this one too from their site; Weight Management. I am interested in the Female Fertility. The Stress & Sleep Formula would be perfect for me! I would love to try the Stress & Sleep. Definitely the weight management. A side effect of the medication that I am on is weight gain, so I could definitely use the weight management. I would love to try the Blood Glucose and Female Fertility supplements. I would be interested in trying the weight management. Would love to try stress and sleep. I def want to try the mental agility supplement….I need help focusing and concentrating. I would like to try the blood glucose supplement. I’d actually like to try the stress and sleep one. I would like to try the mental agility. I would like to try the eye care supplement. I would love to try the weight management. I’d love to try Hair, Skin, & Nails supplement. I would like to try the Weight Management supplement. I think the postnatal slim would be the first for me to try. The lead detox is also interesting. I am interested in the Hair, Skin & Nails formula. I would love to try the Hair, Skin and Nails!